SuperChoir 2017 – What a concert! The Devizes Rotary SuperChoir Concert went ahead as planned earlier this month. The Rotary Team, together with Artistic Director Carol Berry and Technical Director Chris Berry, spent the morning setting up the hall so that everything was ready for the choirs when they arrived in the early afternoon. 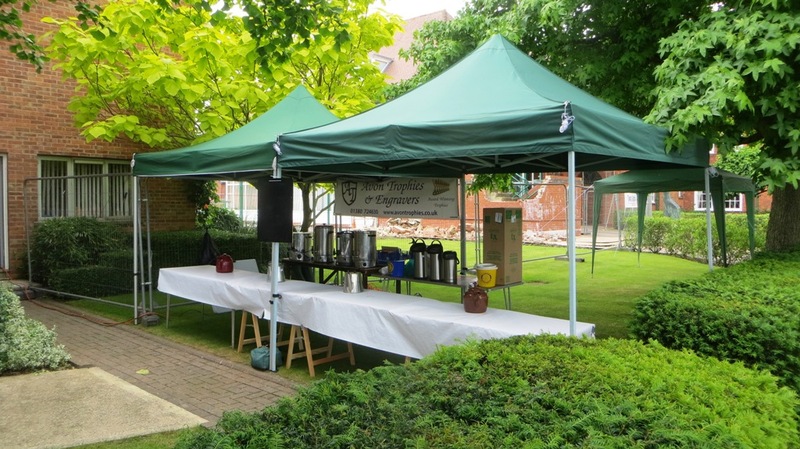 The Rotary Team then set up the canteen so that the children could enjoy their tea after they’d had time to practise together on the stage. After tea it was suddently time for the performance, and what a performance it was as the children sang their hearts out to the 8 songs featured in the first part of the show. The performance was wonderful, so proud of my little boy. All of the children were marvellous, such a wonderful event and a lovely way to spend an evening. 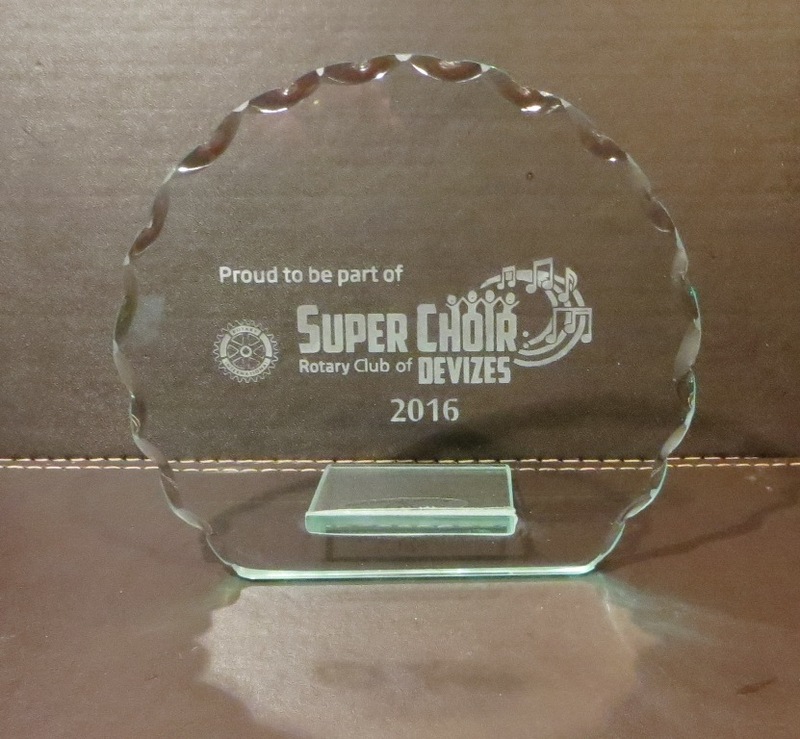 The Devizes Rotary SuperChoir 2017 concert will take place on Wednesday 12th July 2017 at Dauntsey’s School. Pupils from Soutbroom St James Academy, St Nicholas VC Primary School, The Trinity CE Primary School, Wansdyke School and Woodborough CofE School will sing together on the main stage between 18:30 and 20:30, and once again all participating schools will receive a Devizes Rotary SuperChoir banner and plaque, and each member of the choir will receive a special commemorative t-shirt to be worn during the performance. 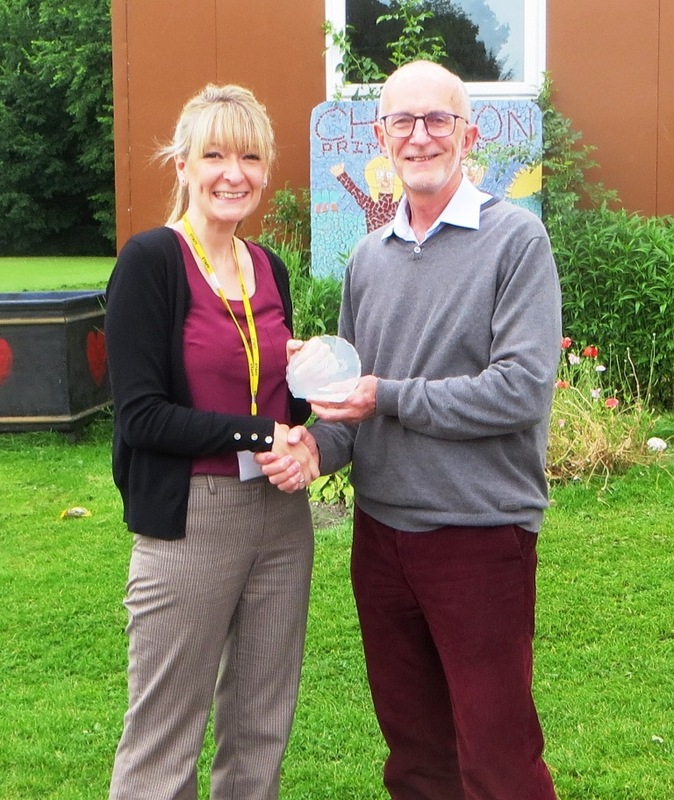 Following the huge success of the recent Rotary SuperChoir event, the Rotary Club of Devizes who organised the event have been presenting each of the 11 schools which took part with commemorate plaques. The second annual Devizes Rotary SuperChoir event took place on July 6th at Dauntsey’s School where over 250 excited children aged from 6 to 14 years sang in front of a captivated audience of over 500. Just like last year, the Devizes Rotary Team organised the logistics for the event. For example they laid on transport for all the children, teachers and helpers from each school, and set up areas for them to leave their belongings while they all got together to do their rehearsals as one big SuperChoir. The Rotary team, including some of their fantastic Friends of Devizes Rotary, did a great job in getting the venue ready, including laying out all the food and drink before the school kids descended on the cafeteria to enjoy a well earned meal. 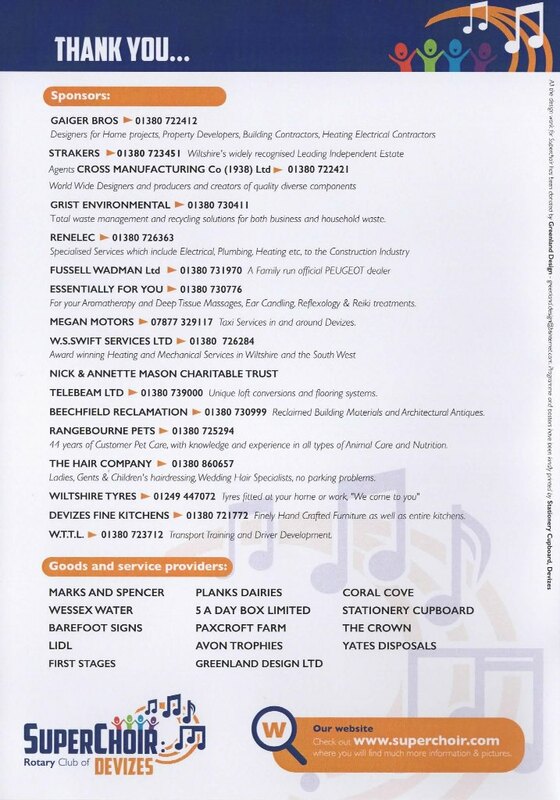 Many thanks are due to our wonderful sponsors for providing much of the food and drink, and other essential equipment such as extra toilets! After the meal it wasn’t long before all the mums, dads, grannies & granddads plus various dignitaries began to arrive. A real buzz had developed around the packed hall by the time 6:30pm arrived, and the show began with a super rendition of Simon May’s song Always There. Thanks again to the Rotary Club Team, the audience was able to enjoy refreshments during the interval, and many also had time to test their luck on the Rotary Tombola stall. Before we knew it the show drew to a close with a wonderful version of Smile by Charlie Chaplin, but the audience weren’t to be denied an encore and were delighted when the choir sang Gary Barlow’s Sing for the second time that evening. Thanks once again to everyone from the Rotary Club, including the Club’s Friends for playing a key role in making this all happen, and to Simon, Carole and the supporting musicians and technicians for helping to put on such a fantastic show. But most of all thanks to every single member of the SuperChoir who put their hearts and souls into making this such a very special day. Pictured at St Barnabas school in Market Lavington unveiling their banner this week are (back row L to R) Fiona Underwood from Urchfont C of E Primary School, Carole Berry SuperChoir Artistic Director and Lindsay Clough from St Barnabas C of E Primary. COMPOSER Simon May, who is best known for his EastEnders theme tune, is helping to organise the second Devizes SuperChoir event this summer. Schools are already getting their youngsters ready for the giant concert and are proclaiming their involvement by putting large banners on their gates. Last year’s event organised by the Rotary Club of Devizes with the backing of Mr May and artistic director Carole Berry of First Stages Musical Theatre Group was a huge success with hundreds of children taking part. This time ten schools have already signed up and around 300 youngsters will perform at Dauntsey’s School, West Lavington, near Devizes, on July 6. 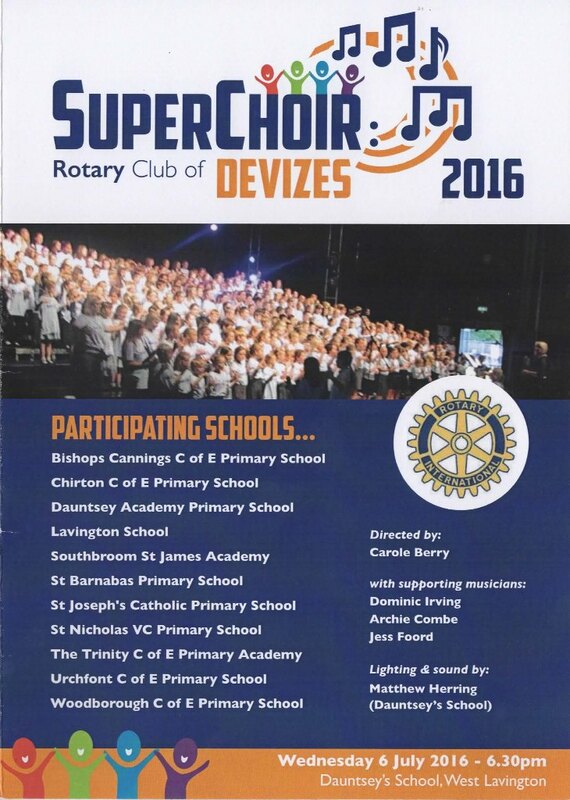 Cliff Evans, president elect of the Rotary Club of Devizes said: “Devizes area schools are once again going to lift the roof at Dauntsey’s School in the second running of SuperChoir in the UK. 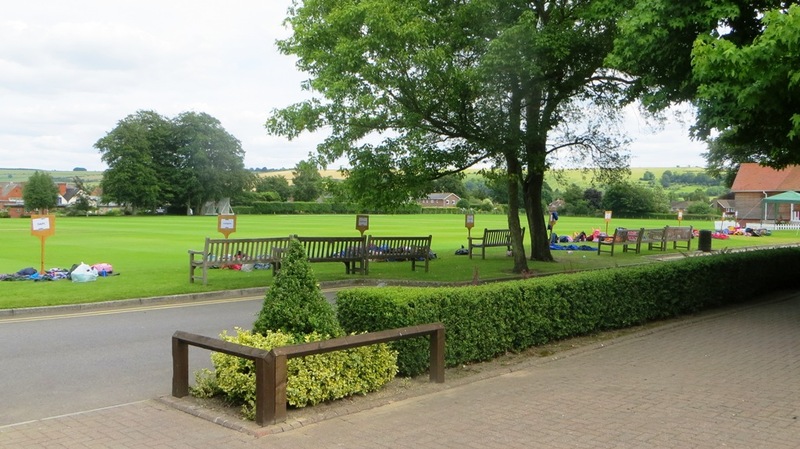 The latest school to sign-up for this year’s event is Woodborough C of E School at Woodborough near Pewsey but St Barnabas Primary in Market Lavington already has its banner and staged an unveiling last week. Mr May, who returned to his home town of Devizes last summer to launch his autobiography, spoke at the time about the importance of the super choir concert and the need the get children involved with music from a young age. He grew up in Station Road at a time when trains still stopped just down the road and then went on to St Peter’s Primary before moving on to Dauntsey’s. At the book launch in Albion Square a number of the children from the SuperChoir performed with him. This year all participating schools will receive a SuperChoir banner and plaque, and each member of the choir will receive a special commemorative t-shirt to be worn during the performance. 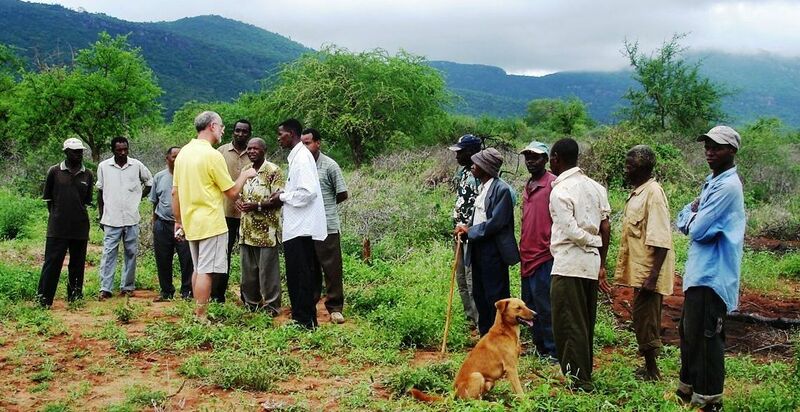 Ten years ago this year, I agreed with the Council of Elders from the village of Mwakoma in Southern Kenya that the newly formed Kileva Foundation charity would build a new school in their village. The first foundation stones were duly laid on a specially cleared piece of bush land in 2006. Since then there have been many remarkable firsts at the resulting Kileva Eastfield School, but none have been more exciting than one recently where, as part of the school’s 10 year anniversary celebrations, it hosted the first Rotary SuperChoir event to be held in Africa, indeed anywhere outside the UK. The following video captures that amazing event. When Devizes Rotary organised the first SuperChoir event for schools in their area last year, little did they realise that due to its great success they would not only be organising the same event again this year, but would also have organised the first event to take place in Kenya! SuperChoir has truly gone international!